The Doggies were the surprise package of last season, getting all the way to the Grand Final before South Sydney put a leash on them. With a heavyweight pack, Origin winning half backs in Hodkinson and Reynolds and the united Morris twins in the backs, they’ve got just as good a chance of throwing up a few more surprises this year. Last year’s home jersey from namesakes Canterbury was one our favourites, with its stark, unfussy design adding a touch of class to proceedings. The old adage of ‘if it ain’t broke, don’t fix it’ is the case this season with only a few tweaks. The thin white line that goes from the armpit to the collar has disappeared, creating a bolder block of blue on the arm; while the inside if the collar is now red. These minor adjustments make little difference however. 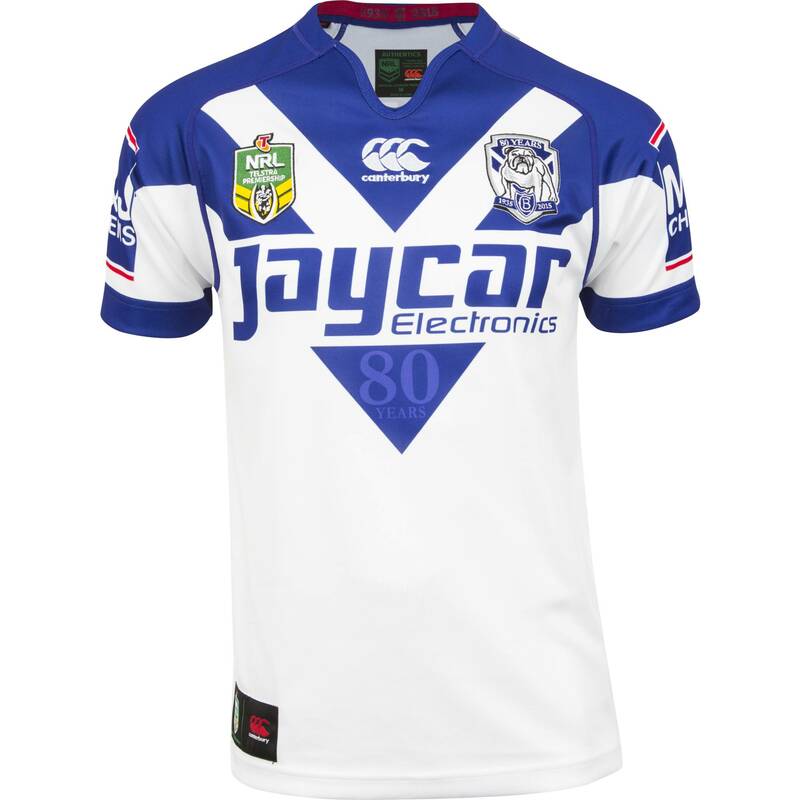 The only noticeable addition is the faint ’80 years’ text written at the point of the chevron – guess what year the Bulldogs were founded mathematicians – which is a nice touch for one of the oldest clubs in the competition. 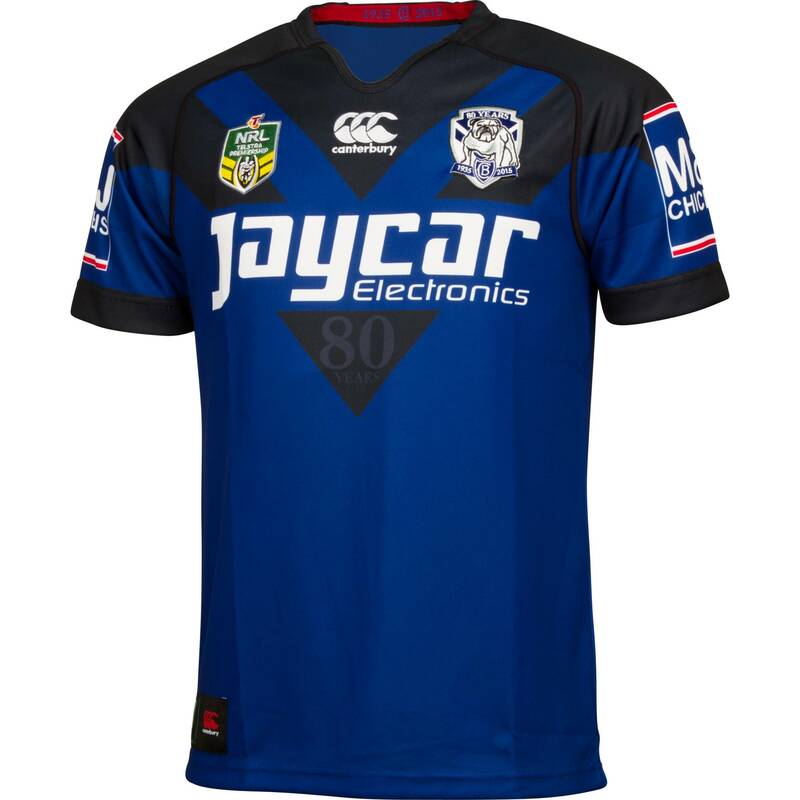 The big change comes on the away jersey, keeping the predominant blue change colour we saw last season, but rather than simply palette-swapping to white on the chevrons, Canterbury has gone for a far more menacing black. It’s a brave move given how little contrast there is between the two colours, but the simplicity of the design and white highlights of the main sponsor and badge help add interest to this potentially rather dark affair. So, a classy refresh of last year’s design for the home shirt, and a sleek, moody shirt for the alternate – neither of these designs are reinventing the wheel, but sometimes classy simplicity is all you need. Nice.